Arthritis is a condition that affects the joints, cartilage, muscles, bones, and connective tissue, thereby disrupting or halting normal movement. More specifically, arthritis consists of more than 100 different musculoskeletal conditions and diseases that affect individuals of various ages. Although there are various forms of arthritis, three of the most common forms are osteoarthritis, rheumatoid arthritis, and juvenile arthritis. Osteoarthritis is the most common form of arthritis that affects approximately 27 million people in the U.S. It is a condition in which the cartilage that protects and cushions the joints begins to break down or degenerate. Therefore, it is also referred to as a progressive degenerative joint disease. The breakdown of the cartilage causes bones to rub against each other and this leads to pain, stiffness, and problems moving the joints. Although the cause of osteoarthritis is not fully understood, risks associated with this form of arthritis include age, genetics, being overweight or obese, a previous joint injury, overuse of a joint, and weak muscles. Osteoarthritis typically affects the joints, but may also affect the neck, the ankles, the toes, and small finger joints such as the base of the thumb. Symptoms of osteoarthritis tend to develop gradually and typically include pain, soreness, and stiffness that occurs after rest and improves during activity. The pain may initially be moderate and periodic, without affecting an individual’s ability to perform daily activities. 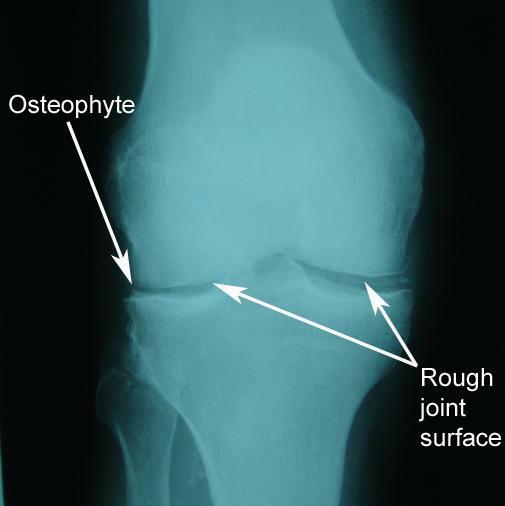 This is the early stage of osteoarthritis and in some individuals the condition will not progress past this stage. However, in other individuals this condition will gradually get worse and the pain and stiffness that is associated with more severe cases of osteoarthritis may make it difficult to climb stairs, walk, perform daily tasks, and sleep. Rheumatoid arthritis is another common form of arthritis that is characterized by inflammation of the membranes that make up the lining of joint tissue. This condition causes pain, stiffness, swelling, severe joint damage, and skin that is warm to the touch. Furthermore, if a joint on one side of the body becomes inflamed due to this condition, the same joint on the other side usually becomes affected as well. It is often reported that the severity of this disease and the pain it causes varies from person to person and that symptoms may change from one day to the next. However, a sudden increase in symptoms is called a flare and when this occurs it can last for days or even months. Rheumatoid arthritis is described as an autoimmune disease because the immune system, which under normal conditions protects the body by attacking and removing foreign substances such as viruses and bacteria, mistakenly begins to attack joint tissue. This abnormal immune system response causes inflammation that may damage organs such as the heart, in addition to the joints. Rheumatoid arthritis affects approximately 1.5 million people in the U.S. and women are three times more likely to develop this condition than men. Rheumatoid arthritis generally begins to affect women between the ages of 30 and 60 and tends to affect men later on in life. Despite these incidence rates, early diagnosis of rheumatoid arthritis is critical in order to prevent organ and joint damage. Juvenile arthritis is a collective term that is used to describe the different inflammatory and autoimmune conditions that can develop in children ages 16 and younger. This condition typically affects the joints, but may also affect the skin, eyes, and gastrointestinal tract in children and adolescents. The most common type of juvenile arthritis is juvenile idiopathic arthritis, but a child must be younger than 16 and experiencing the initial stages of swelling in one or more joints for at least six weeks before being diagnosed with this condition. There are no known causes for juvenile arthritis and although it has been suggested that foods, allergies, or toxins cause children to develop this disease, there is no evidence that supports this notion. However, research has indicated a potential genetic predisposition to developing this disease. Arthritis is becoming a serious health problem in the U.S. This disease affects approximately 50 million people in the U.S. and although it is often believed to be a disease of the elderly, people of all ages may develop arthritis. According to reports, two-thirds of arthritis sufferers are under the age of 65 and this includes approximately 300,000 children. Approximately 36 million people who have this disease are Caucasian American, an estimated 4.6 million are African American, and 2.9 million are Hispanic or Latin American. Arthritis is also currently the leading cause of disability and creates more mobility problems than heart disease, diabetes, or cancer. It is anticipated that the number of individuals with arthritis will continue to increase over the next 20 years and that by 2030 approximately 67 million people in the U.S. may develop arthritis, unless the current incidence rates are reversed. Arthritis is also beginning to place a major burden on the economic and health care systems in the U.S. For instance, this disease accounts for an estimated 44 million outpatient visits to the doctor as well as over 900,000 hospitalizations every year. Reports involving patients who were observed from 2003 to 2010 indicate an association between certain surgical procedures that are used to treat arthritis and longer hospital stays after the surgery, especially when the procedure is for the late stages of arthritis. These observations may be attributed to individuals taking too long to seek treatment, as well as the type of arthritis an individual has. When arthritis is diagnosed and treated during the early stages, if surgery is necessary, it may only require a same day or one day procedure as opposed to having to remain hospitalized for several days. Longer hospital stays result in an increased need for healthcare resources and equipment, as well as higher medical costs. According to reports, between 2002 and 2011 there has also been a considerable increase in costs for patients ages 18 to 64 who have rheumatoid arthritis. This increase in costs has been attributed to an increase in prescription medications in conjunction with a decrease in hospitalizations, and additional costs such as sick leave and work disability. A rise in medication costs from 2009 onward has also been associated with the increase in rheumatoid arthritis treatment costs that patients are experiencing. Overall, the costs to treat arthritis are consistently increasing and this trend will undoubtedly continue unless the current incidence rates of arthritis begin to decrease. There are a number of different forms of arthritis and therefore, there are also a number of different factors that influence an individual’s susceptibility to developing arthritis symptoms. However, gaining an impression of how the joints work helps describe how arthritis often develops. Joints are regions where bones intercept and ligaments within the joints hold the bones together. Ligaments are made up of tissue that expands and contracts like elastic. Furthermore, ligaments keep bones in place, while the muscles surrounding the bones contract and relax in order to allow the joint to move. Cartilage is another form of tissue that covers the surface of bones in order to stop the bones from rubbing together and becoming damaged. In addition, the space within the joint contains synovial fluid that promotes mobility by nourishing the joint and the cartilage. All of these individual structures of the joint are susceptible to damage from typical every day wear and tear, as well as acute injuries or trauma. When arthritis develops, it may indicate a problem with either the cartilage, synovial fluid, or the immune system. More specifically, the type of arthritis that develops provides an impression of whether issues such as worn cartilage, a decrease in synovial fluid, an abnormal immune system response, an infection, or a combination of factors has occurred. 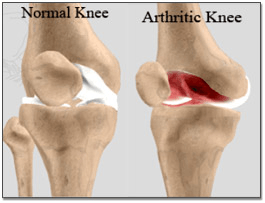 For instance, osteoarthritis is a chronic condition that is characterized by damage to the cartilage within the joints. The cartilage can become damaged as a result of wear and tear across a number of years or as the result of an injury. When this occurs, the cartilage is unable to function as the protective material that cushions the joints. If the cartilage sustains enough damage, there is also a high risk of bone rubbing directly onto bone. This leads to significant pain, especially during activity, as well as a loss of flexibility within the joint itself. Rheumatoid arthritis, which is another very common form of arthritis, is characterized by an abnormal immune response to the body’s own joints. More specifically, an individual’s immune system begins to attack the synovial membrane that lines the joint capsule and envelopes all of the joint’s structures. As a result, the synovial membrane becomes swollen and inflamed. Rheumatoid arthritis is a serious autoimmune disease and, if left untreated, can progress from simple joint damage to more serious organ damage. Arthritis affects everyone differently and this means that the symptoms one person may experience can be different from another person with the same condition. Symptoms can either be temporary or may become chronic. The severity of pain and additional symptoms that are experienced can range from mild to severe, and the pain may be persistent and constant or more transient in nature; meaning the symptoms come and go periodically. Generally, patients with arthritis tend to report that some days are better than others with regard to the severity of their symptoms such as pain and stiffness. Various forms of arthritis, such as osteoarthritis, are typically diagnosed after a physician evaluates a patient’s medical history. This process includes asking for a description of the physical symptoms as well as conducting a physical exam. Imaging techniques such as x-rays or magnetic resonance imaging (MRI) may also be used to visualize the condition of the joints. If more than one type of arthritis, such as rheumatoid arthritis and juvenile arthritis, is suspected, lab tests of the blood, urine, and synovial fluid within the joints, may also be conducted to help determine the type of arthritis a patient may be suffering from. Lab tests can also help a physician rule out other diseases that may be causing the symptoms. In order to properly diagnose rheumatoid arthritis, blood tests that can reveal markers specific to this condition are often conducted. The markers include a variety of antibodies that are generally present in approximately 70-90% of individuals who have developed rheumatoid arthritis. Rheumatoid markers may also circulate in the blood of individuals who do not have rheumatoid arthritis, but the markers are usually higher in individuals suffering from this condition. In reference to juvenile arthritis, there is no single lab test that exclusively confirms this condition. In most cases, blood testing helps reveal the presence of inflammation or a possible infection, but these results do not typically help a physician make a clear diagnosis. Therefore, in children the key to properly diagnosing juvenile arthritis is conducting a thorough physical exam including x-rays or additional imaging techniques, along with evaluating the child’s medical history. In general, early diagnosis is the key to receiving treatment that can reverse or prevent the progression of the disease. Arthritis that is left untreated can lead to permanent damage of the joints, cartilage, ligaments, and bones, which may cause deformities and decreased mobility that may not be reversible. Furthermore, some forms of arthritis can affect other structures in the body; therefore, early diagnosis is crucial in order to avoid serious injury or damage to bodily organs. An early diagnosis may also help a patient avoid intrusive forms of treatment such as surgery. Currently, there are no cures for arthritis. The primary goal for the treatment of arthritis involves providing pain relief and improving joint function by increasing mobility and strength. Initial treatment options for arthritis include medication, devices that protect the joints (e.g., a band or brace), hot and cold compresses, and exercise. Although people with arthritis may believe that they should not exercise or avoid doing so due to the pain that is experienced, clinical reports provide strong evidence that certain types of endurance and resistance exercises are beneficial for individuals suffering from the early stages of rheumatoid arthritis and osteoarthritis. Research also indicates that weight management, exercise, and avoiding joint injuries can greatly reduce the occurrence of osteoarthritis or a flare up of arthritis symptoms. For instance, in individuals who are overweight, every pound that is lost results in four pounds of pressure being taken off of the knees. This can prevent or reduce inflammation and injury of the joints. If the initial treatment methods are ineffective, physical therapy may be recommended. Sometimes a combination of several treatments effectively reduces or eliminates the symptoms. However, if none of these treatments lead to an improvement or serious damage occurs, surgery may become necessary. In addition to regular exercise, physical therapy is very helpful for individuals with arthritis. Individuals who have arthritis tend to have physical activity levels that are lower than what is recommended for maintaining a healthy lifestyle. Therefore, physical therapists tend to utilize behavioral change techniques based on both biological and psychosocial perspectives. These types of physical therapy programs involve educating individuals with arthritis about how to engage in health-enhancing physical activity. Current reports indicate that individuals whose disease is at a later stage, who are on disability, or who have strong social and familial support are more likely to receive physical therapy services. The types of fish and nuts listed above contain omega-3 fatty acid, and omega-3 fish oils have demonstrated the ability to drastically reduce the symptoms of arthritis, especially rheumatoid arthritis. In addition, extra-virgin olive oil contains a natural compound called oleocanthal that appears to help prevent and reduce arthritis-related inflammation. This compound also has the ability to block the same inflammatory pathways that anti-inflammatory drugs such as ibuprofen and aspirin do. Extra-virgin olive oil contains high amounts of oleocanthal. Antioxidants such as vitamin C, carotenes, and bioflavonoids also protect the body from the effects of inflammatory compounds and have the ability to help prevent arthritis, slow down the progression of the disease, and relieve pain. Regular relaxation practice and guided imagery are also alternative treatment options that are available for the treatment of arthritis pain. Mental imagery, also known as visualization, is the process of imagining oneself performing a particular action. It is also referred to as guided imagery because a professional generally guides an individual through the imagined activity. Reports indicate that mentally practicing an activity, before actually executing the necessary motor skills that are required to complete the action, have the ability to enhance subsequent performance. In some cases, visualization influences motor skill performance better than if no form of mental practice is conducted. Furthermore, imagining an activity before engaging in it has a more dramatic effect on the overall performance than doing strength or motor exercises in the absence of prior guided imagery. Current research also suggests that visualization is a useful technique that demonstrates the mind’s ability to transform mental imagery into enhanced physical activity. Over-the-counter medication may be used when arthritis symptoms begin to cause mild to moderate pain and inflammation. Severe pain, whether it is periodic or chronic, may be treated with prescription medication and there are over one hundred different types of medications available for the management of many types of arthritis. Indeed, the first line of treatment, for many cases of arthritis, is a non-steroidal anti-inflammatory drug (NSAID) such as ibuprofen. This is due to the ability of these types of drugs to reduce inflammation within the joint and, thereby, reduce pain. Typically, at the site of inflammation, harmful fluids that contain pain-inducing enzymes accumulate. Non-steroidal anti-inflammatory drugs (NSAIDs) reduce the accumulation of these fluids. These types of drugs also block the release of the pain-inducing enzymes that can augment inflammatory reactions. NSAIDs that can be taken orally are a very common form of treatment for inflammation. Analgesics are also recommended due to their pain-relieving qualities. However, this class of medication does not offer the same anti-inflammatory qualities as non-steroidal anti-inflammatory drugs. Given the chronic nature of arthritis, many patients may consider undergoing slightly more invasive forms of treatment in order to manage their arthritic pain. There is some support regarding the benefits of corticosteroid injections to reduce the degree of inflamed tissue as well as the pain that is experienced. Corticosteroids, such as prednisone and cortisone, may be recommended to reduce inflammation, as well as suppress an individual’s immune system. This is especially helpful in cases where an individual’s immune system has started to attack the joint (e.g., rheumatoid arthritis). There are a number of different types of corticosteroid injections, and treatment plans typically involve multiple injections to achieve maximum pain relief. For instance, joint injections are often recommended for individuals with arthritis. This procedure is very common and involves injecting medication directly into the joint to relieve swelling and pain. Joint injections typically involve using a needle to inject both steroids and an anesthetic into the region of the joint where tissue has become inflamed due to arthritis. The steroids lead to a reduction of inflammation, while the anesthetic leads to the reduction or elimination of pain. This type of procedure is brief and some patients have reported experiencing immediate pain relief. Joint injections can also be repeated if necessary in order to improve the treatment outcome. Previous studies have shown that individuals who receive this form of treatment have reported significant pain reduction, along with an improvement in their quality of life, and an increased range of motion. Medial branch blocks are another minimally invasive treatment that may be suggested for managing arthritic pain. This procedure involves an injection into the facet joints of the spinal cord in order to block the transmission of pain signals to the brain. Facet joints are structures that connect the vertebrae along the spine. Networks of medial branch nerves are located within facet joints and these tiny nerves transmit pain signals to the brain when nerve tissue becomes damaged or inflamed. When the pain becomes chronic, a medial branch block is often performed in order to destroy the medial branch nerves and reduce or completely alleviate the arthritic pain. The medial branch block has been documented as an effective treatment for patients with arthritic pain that successfully improves mobility, reduces pain, and in some cases, alleviates it. If a physician believes that surgery may be necessary in order to improve arthritis symptoms, corticosteroid injections and medial branch blocks may also be utilized as pain-relieving diagnostic methods that can provide a physician with important information regarding how the body and nerves may react to a certain surgical procedure. The diagnostic blocks are usually nerve blocks in which a needle is inserted into the spinal column at regions where affected spinal nerves are located. Spinal nerves transmit pain signals that have been caused by arthritis to the brain. 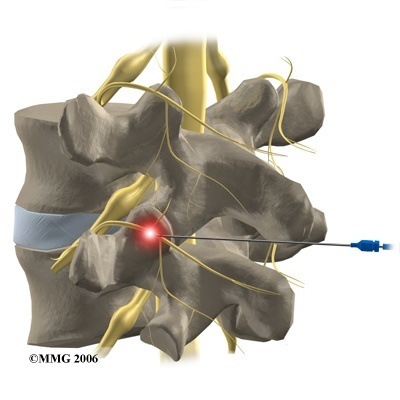 The placement of the needle is visualized with imaging technologies (e.g., fluoroscopy, x-ray, etc.) and once proper placement is confirmed, a catheter is inserted through the needle in order to administer pain-relieving medication to spinal nerves that are responsible for the chronic arthritic pain. A steroid and anesthetic, or a substance that disintegrates nerve tissue is injected in order to relieve pain. This treatment method leads to extended pain relief by blocking the transmission of pain signals. The effectiveness of the diagnostic nerve block provides a physician with an impression of whether or not a particular type of surgery will be successful at improving arthritic pain for longer periods than the nerve block. A diagnostic nerve block is typically performed at least two times and the more pain relief that is experienced from repeated diagnostic blocks, the greater the probability that positive outcomes will be experienced after surgery. Physicians usually prefer to observe positive outcomes from two or more diagnostic blocks before recommending surgery. There is no cure for osteoarthritis, but medication can generally be taken on an as-needed basis in order to manage periodic pain that may be experienced during the early stages of this disease. If the condition continues to progress, a physician may recommend physical therapy or occupational therapy to help maintain strength and function of the affected joint. When the arthritic pain becomes severe and frequent, mobility becomes difficult, or daily activities cannot be performed properly, surgery may be suggested. Patients are encouraged to stay physically active and to maintain a healthy lifestyle. This is especially important during the early stages of osteoarthritis in order to prevent it from progressing. Limited activity can lead to stiffness and weak joints that can further increase arthritic pain. Exercising also promotes strong muscles which protect joints. Finding ways to avoid gaining excessive amounts of weight is also important as being overweight places added stress on the joints. Furthermore, the management of osteoarthritis also involves eating a nutritious diet, maintaining a good balance of rest and recreation, as well as managing stress and depression. Similar to other forms of arthritis, treatment for rheumatoid arthritis aims at reducing inflammation and slowing down the progression of the disease. Over-the-counter pain relievers and prescription medications are typically very effective at reducing the symptoms of rheumatoid arthritis. Medication that suppresses the abnormal immune system response is also quite effective and may lead to a state of remission, which means that the inflammation completely ceases or is extremely low. Even if remission occurs as a result of treatment, a physician will monitor the levels of inflammatory markers on a regular basis through lab tests and physical examinations in order to determine how well the treatment is working. If the symptoms begin to return, the physician may prescribe a different type of medication or adjust the dosage. Self-management is also an important part of controlling rheumatoid arthritis symptoms. Staying physically active is critical to keeping joints flexible as too little movement can cause joint stiffness. It is helpful, however, if individuals with this disease work with a physical therapist in order to learn the appropriate types of exercises that should be performed, as well as the proper techniques. Emphasis is also placed on maintaining a nutritious diet and a healthy weight. Painful symptoms may dramatically decrease by implementing these types of lifestyle changes. The goal of treatment for juvenile arthritis is to reduce pain and relieve inflammation in order to improve a child’s quality of life. Effective treatment plans typically involve utilizing a combination of healthy eating habits, medication, eye care, and physical activity. However, the treatment plans that are chosen are specific to each child and require that a health care team, which might include a pediatric rheumatologist, ophthalmologist, dentist, physical therapist, and nurse practitioner, among others, carefully evaluate and monitor the child’s condition. This is important because each child responds differently to treatment. There are two types of medications that are commonly used to treat juvenile arthritis. The first group is non-steroidal anti-inflammatory drugs (NSAIDs), corticosteroids, and analgesics as these medications help relieve pain and inflammation. The second group is a class of drugs called disease-modifying anti-rheumatic drugs (DMARDs), which may cause the disease to go into remission and help prevent joint damage. In some cases, different medications have to be prescribed and the dosages have to be adjusted until the child begins responding positively to the treatment. Furthermore, some medications affect the immune system or cause unwanted side effects, so a physician will frequently monitor the treatment regimen. Arthritis is a serious health problem in the U.S. that affects approximately 50 million people. It is currently the leading cause of disability. Arthritis is a collective term for over 100 muscoskeletal conditions and diseases that affect individuals of all ages. 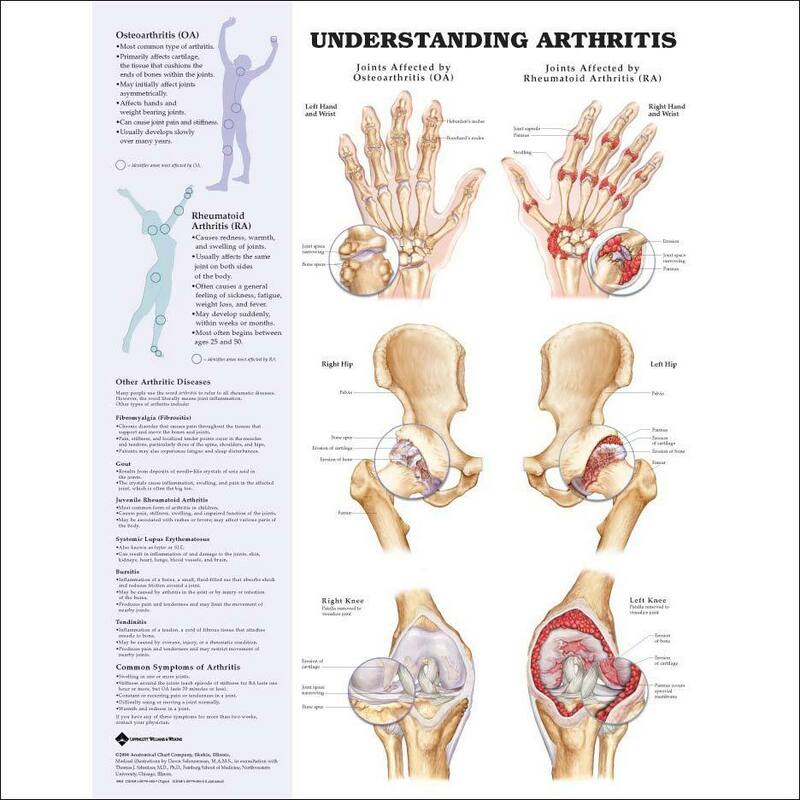 While there are over 100 different classifications of arthritis, three of the most common forms are osteoarthritis, rheumatoid arthritis, and juvenile arthritis, and common symptoms include pain, swelling, stiffness, and weakness in the joints. In cases of osteoarthritis, symptoms are generally the result of damage to joints that may be caused by general wear and tear or by an injury. Rheumatoid arthritis is generally the result of an abnormal immune system response, and most children who develop juvenile arthritis are genetically predisposed to this condition. Currently, there are no cures for arthritis, but there are a number of different treatment options for managing the pain and inflammation that is associated with arthritis. In general, a trial period of more conservative forms of treatment is recommended prior to undergoing more invasive forms of treatment such as surgery. Conventional treatment methods include medication, exercise or physical therapy, or hot and cold compresses. Patients with chronic arthritis pain are also encouraged to speak with their physicians about the possibility of using corticosteroid injections to help relieve their symptoms of chronic pain before considering surgery. Most types of arthritis can be properly managed when diagnosed during the early stages and the treatment methods that are utilized are generally effective at minimizing pain and disability. In addition, early diagnosis and treatment may be able to prevent tissue damage that may be caused by arthritis. Receiving treatment early on is particularly important for rheumatoid arthritis in order to help prevent the progression of this disease, which can lead to organ damage, deformities, and disability. When in doubt, it is better to seek medical attention if chronic pain and inflammation is being experienced in one or more joints. At Nevada Pain our goal is to relieve your arthritis pain and improve function to increase your quality of life. Ayral X. Injections in the treatment of osteoarthritis. Best Pract Res Clin Rheumatol. 2001;15(4):609-626. Gvozdenović E, Dirven L, van den Broek M, Han KH, Molenaar ET, Landewé RB, Lems WF, Allaart CF. Intra articular injection with corticosteroids in patients with recent onset rheumatoid arthritis: subanalyses from the BeSt study. Clin Rheumatol. 2014; in press. Huscher D, Mittendorf T, von Hinüber U, Kötter I, Hoese G, Pfäfflin A, Bischoff S, Zink A; for the German Collaborative Arthritis Centres. Evolution of cost structures in rheumatoid arthritis over the past decade. Ann Rheum Dis. 2014; in press. Messier SP, Mihaiko SL, Legault C, et al. Effects of intensive diet and exercise on knee joint loads, inflammation, and clinical outcomes among overweight and obese adults eith knee osteoarthritis: The IDEA randomized clinical trial. JAMA. 2013;310(12):1263-1273. Mori M, Takei S, Imagawa T, Imanaka H, Nerome Y, Kurosawa R, Kawano Y, Yokota S, Sugiyama N, Yuasa H, Fletcher T, Wajdula JS. Etanercept in the treatment of disease-modifying anti-rheumatic drug (DMARD)-refractory polyarticular course juvenile idiopathic arthritis: experience from Japanese clinical trials. Mod Rheumatol. 2011;21(6):572-580. Nessen T, Opava CH, Martin C, Demmelmaier I. From clinical expert to guide: Experiences from coaching people with rheumatoid arthritis to increased physical activity. Phys Ther. 2014;in press. Pakzad H, Thevendran G, Penner MJ, Qian H, Younger A. Factors associated with longer length of hospital stay after primary elective ankle surgery for end-stage ankle arthritis. J Bone Joint Surg Am. 2014;96(1):32-39. Scott IC, Tan R, Stahl D, Steer S, Lewis CM, Cope AP. The protective effect of alcohol on developing rheumatoid arthritis: A systematic review and meta-analysis. Rheumatology. 2013;52(5):856-867. Superio-Cabuslay E, Ward MM, Lorig KR. Patient education interventions in osteoarthritis and rheumatoid arthritis: A meta-analytic comparison with nonsteroidal anti-inflammatory drug treatment. Arthritis & Rheumatism. 1996;9(4):292-301. Vitiello MV, McCurry SM, Shortreed SM, Balderson BH, Baker LD, Keefe FJ, Rybarczyk BD, Von Korff M. Cognitive-behavioral treatment for comorbid insomnia and osteoarthritis pain in primary care: The lifestyles randomized controlled trial. J Am Geriatr Soc. 2013;61(6):947-956. Yates CM, Calder PC, Ed Rainger G. Pharmacology and therapeutics of omega-3 polyunsaturated fatty acids in chronic inflammatory disease. Pharmacol Ther. 2014;141(3):272-282. Zhang H, Xu L, Wang S, Xie B, Guo J, Long Z, Yao L. Behavioral improvements and brain functional alterations by motor imagery training. Brain Research. 2011;1407:38-46. Erdem E. Prevalence of chronic conditions among medicare part a beneficiaries in 2008 and 2010: are medicare beneficiaries getting sicker? Prev Chronic Dis. 2014;11:E10. Fleming A. Drug management of arthritis in the elderly. J R Soc Med. 1994; 87(Suppl 23):22-25. Iversen MD, Chhabriya RK, Shadick N. Phys Ther. Predictors of the use of physical therapy services among patients with rheumatoid arthritis. Phys Ther. 2011;91(1):65-76. Javadi S, Kan JH, Orth RC, Deguzman M. Wrist and ankle MRI of patients with juvenile idiopathic arthritis: identification of unsuspected multicompartmental tenosynovitis and arthritis. AJR Am J Roentgenol. 2014;202(2):413-417.